The immune system is your body’s surveillance system, working 24/7 to identify and eliminate the viruses and bacteria that will make you sick. Your immune system is one of the most complex systems in the body and is made up of various organs, cells and proteins; including your skin, corneas of your eyes, the mucosa of your respiratory system, your gastrointestinal tract, and your lymphatic system. A poor diet, chronic stress and lack of sleep as well as certain medical conditions can affect your immune system. Here are 10 strategies that you can implement to strengthen your immune system this cold and flu season. The flu virus can affect anyone, even the fit and healthy, so it is important to get an annual flu vaccination to protect yourself and also to stop the spread of the disease. Flu vaccinations help to promote herd immunity. If enough people are vaccinated, they can help protect those unable to be vaccinated such as those who are immunocompromised or young infants under 6 months of age. You can now obtain advice and flu vaccinations from the majority of the 5,700 community pharmacies nation-wide usually without the need for an appointment, making it convenient and accessible. We recommend calling your community pharmacy to find the best time to drop in and get vaccinated. Most people don’t wash their hands correctly, especially the areas around their fingernails, between fingers and the backs of their hands. Viruses can survive for some time outside the human body, which means you can get sick from shaking a sick person’s hand or touching high traffic surfaces like a doorknob or fridge door and then touching your face. Hand washing is one of the best strategies you can use to avoid getting sick. It should take you at least 20 seconds to wash your hands. Make sure to use warm water and soap and wash your hands after visiting the toilet, and before and after eating. Also, make sure to dry your hands thoroughly. It makes it harder for viruses to stay airborne if there is moisture in the air. Speak to your pharmacist about suitable products to keep the air moist in your house or office. Saline irrigation solution can also help to keep your nasal passages hydrated especially in heated buildings and relieve congestion if you have a cold. Not getting enough sleep as well as poor quality sleep can have an effect on your immune system. Cytokines are proteins that are released during sleep and play an important role in your body’s ability to fight infections. Sleep disorders are quite prevalent in Australia with over 8% of the population living with sleep apnoea1, which occurs when the walls of the throat come together during sleep and block the airwaves above the voice box. Your community pharmacist is a great source of support and advice if you have sleep apnoea. Drinking lots of water helps flush toxins from the body and keeps mucus in the respiratory tract thin. 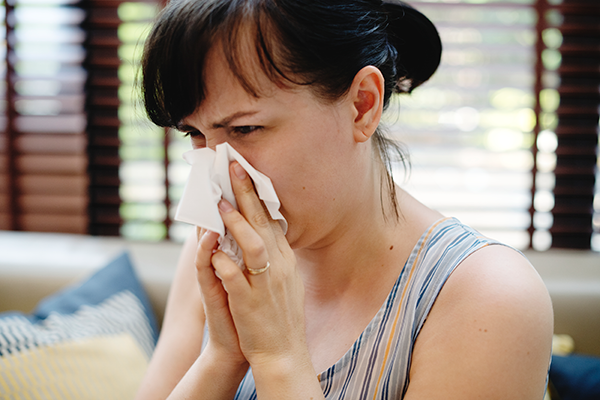 If you have a cold, mucus increases to fight the infection and keeping the mucus thin can make it easier for it to be expelled from the body either through coughing or a runny nose. Eating a healthy, balanced diet which is rich in whole foods, fresh fruit and vegetables, nuts and seeds; is important for a healthy immune system. A large part of your immune system is in your digestive tract therefore it is essential to keep your intestinal lining healthy and functioning well. If you are concerned that your diet is lacking in nutrients or you are concerned about your weight, speak to your community pharmacist. They can provide advice and suggest products and services to assist you. Regular gentle exercise is good for both your immune system and your mental health. Exercise boosts blood flow, which circulates white blood cells around your body. White blood cells are part of the immune system and the body’s first line of defence. They travel through your blood and tissues looking for foreign invaders like fungi, parasites viruses and bacteria. Being cooped up inside heated buildings with recirculated air in winter can help viruses to spread. Use your lunch break to go outside, get some fresh air and replenish your store of Vitamin D from sunshine. Psychologists who work in the field of psychoneuroimmunology believe your state of mind can affect your health2. Managing stress, especially long-term stress, may help people to fight germs. If you are struggling to cope or find yourself feeling depressed, speak to your community pharmacist. Community pharmacies are increasingly playing a major role in helping patients manage mental health issues. You can strengthen your immune system by avoiding stimulants such as energy drinks, excessively caffeinated sodas, and nicotine. Smoking can depress your immune system by suppressing the antibodies created by your body to fight cold and flu viruses. Drinking more than the recommended daily limit of alcohol can lead to weight gain, which is taxing on your immunity. Alcohol dehydrates the body and creates an attractive environment for viruses.